Southeast New York State Pumpkin Patches, Corn Mazes, Hayrides and More - Find Halloween and Fall Fun! Looking for a local pumpkin patch, corn maze, hayride, gourds and other Halloween activities in Southeast New York State? Scroll down this page and you will see the all of those in Southeast New York State, sorted by county. Some are farms, where you take a hay ride out into the field, others are elaborate farm stands with mountains of pumpkins and other activities and some are simple roadside stands. Most have loads of pumpkins to choose from. To really make it fun for your kids, look for those that have the extra activities, like a corn maze, spook house, or hayride. There is usually a small fee for the mazes (of course, the more elaborate mazes tend to charge more. Hayrides are often free. ALWAYS call before you go to confirm the info, they don't always report changes to me! 5 Sunset Avenue, Kinderhook, NY 12106. Phone: (518) 758-7224. Email: info@samascott.com. Open: daily 8 am to 6 pm; See website for seasonal opening date: http://www;samascott;com/. Click here for current open hours, days and dates. Picking updates: Click here for updates. Directions: Click here for a map and directions. Corn maze open Saturdays in September and October at Samascott's Garden Market;. Payment: Cash, Visa/MasterCard, Discover, AmEx. Click here for our Facebook page. New in 2017 is a children's playground and jumping pillow, plus wagon rides around the Orchard. (UPDATED: April 18, 2017). ​65 Chatham Street, Kinderhook, NY 12106. Phone: (518) 758-9292. Fax: (518) 610-8006. Open: Friday and Saturday from 9 am to 9 pm, Sunday to Thuirsday from 9am - 8:00pm Corn maze hours are Saturday and Sunday from 11am - 5pm. Wintje Farms - Pick your own apples, pears and pumpkins. Route 9G, Germantown, NY 12526 - (518)537-6072 - Open June thru November. A visitor writes on September 27, 2010: "First, I love your site thanks for all the information. My comment is about the farm I posted above. I visited yesterday after having been there before with my children. The last time we went the kids had a blast with the corn maze, petting zoo, hayride and tons of apples to pick. This time, however, we were very dissapointed. They are now charging $5 a person just to enter. For a family of 4 that's $20 before we get to the pumpkins, apples and other activities. I asked what my admission was getting me and was told the corn maze, last year everything was free. We drove almost an hour to go there yesterday and we didn't get to do any of the activities because of the new fee. We did go do the apple picking, although I wish we were warned that ALL the apples have fallen off the trees and were on the floor. There was no apples for the kids to pick. I was amazed. Thank you for letting me give my feedback and I hope others are now aware that they are charging for you to walk in and as of Sep 27, 2010 there were no apples on the trees!" 31 Dykeman Lane, Pawling, NY 12564. Phone: 845-832-6068. Email: cornlabs@gmail.com. Open: for Pick Your Own Pumpkins in our fields; every Saturday and Sunday in October, and including Columbus Day Monday, from 10:00 am until 5:00 pm; Our farm stand is open every day from July 1 through October 31 from 9am to 6pm. (After Labor Day our hours are 10am to 5pm) We have an honor system after hours for those of you who are unable to shop during these hours. Directions: From Route 22 in Pawling-Proceed North on Route 22 to River Road Turn left onto River Rd, Follow to the end. Make a right onto West Dover Road Follow this road for 3 miles to our farm. Click here for a map and directions. Payment: Cash, Check. Click here for our Facebook page. We use conventional practices on our farm. Everything we sell at our stand is grown by us or locally grown. We sell our Sweet Corn Fresh Picked every day, never "Day old". We offer Field Trips for Nursery Schools and Elementary Schools in early October. Free hayrides and our Pick Your Own Pumpkins takes place EVERY Weekend in October. 407 North Tower Hill Rd, Millbrook, NY 12545. Phone: 845 677-3785. Open: 9:30 am to 5:00 pm weekends and Columbus day October 1 to October 14 - Pumpkin Patch is now Closed for the 2013 Season; Visit us for Christmas Trees! November 23rd-December 22nd. Click here for current open hours, days and dates. Directions: From the taconic parkway exit route 44 east toward Millbrook. Follow signs to right on deep hollow road, make right on N. Tower hill road to farm on right. Click here for a map and directions. Payment: Cash, only. Click here for our Facebook page. Harvest holiday family fun by picking your own pumpkins, gourds, ornamental corn. Free hayrides and parking. Pick Your Own Pumpkins! Harvest Holiday Family Fun... Many varieties of Pumpkins, Gourds and Ornamental Corn! Free Hay Rides and Parking! 221 Middle Road, Rhinebeck, NY 12572. Phone: 845-590-9642. Alternate Phone: 845-758-2258. Fax: 8457583650. Email: kfcproduce@yahoo.com. Open: Fall Festival is Every Saturday & Sunday from September 19 to November 1 & Monday October 12; hours are 10:00am to 6:00pm. Click here for current open hours, days and dates. Directions: Click here for a map and directions. Payment: Cash, Check. Click here for our Facebook page. In the fall, spend the day with us enjoying our corn maze, wagon rides through the corn, hay rides, feed and pet our farm animals, and our delicious apple cider donuts. All year round we offer our own farm raised, grass fed beef, pork, lamb, and chicken. You can also enjoy our farm fresh eggs all year round. 83 Route 22, Pawling, NY 12564. Phone: 845-878-7492. Fax: 845-878-7405. Email: mrcorn1@aol.com. Open: Monday to Saturday from 9 am to 7 pm; Sunday, from 9 am to 6 pm. Click here for current open hours, days and dates. Pumpkin updates: Click here for updates. Directions: . Click here for a map and directions. Month of October, each weekend Elmo and Cookie Monster make an appearance; Pumpkin Patch; Hayrides and Haunted Forest recommended for Children under 10 years of age; School Groups by appointment only; Homemade Apple Cider Doughnuts; Open for Christmas Trees from Thanksgiving till Christmas Eve; Free Hot Cider and Hot Chocolate; Santa and Snowman will be visiting on the weekends. Payment: Cash, Check, Visa/MasterCard, Discover, AmEx. Click here for our Facebook page. 15 Scism Rd, Tivoli NY, 12583. Phone: (845) 456-5641. E-mail: clmead@ulster.net. Picturesque, 100-acre fruit orchard and vegetable farm, located in the beautiful Mid-Hudson River Valley of New York. We grow over 30 varieties of apples (McIntosh, Cortland, Macoun, Golden Delicious, Red Delicious, Jonagold, Mutsu, Idared, Rome, Fuji and others) as well as peaches, pears, and plums. We also grow a large variety of summer vegetables, winter squashes, pumpkins, and gourds. Open: Weekends & Monday holidays, 9:00 am to 6:00 pm, August, September, and October. Directions and info - see website. IMPORTANT NOTICE: (Oct 9) The apple varieties available to pick this weekend may have changed from our published schedule. When we set up our picking schedule, we use our past experience, and our best educated guess (weeks ahead of their expected harvest time) to judge which varieties will most likely be ripe on which weekend. Usually we're pretty close... not so much this year. It's nature, folks! We apologize for the inconvenience, and appreciate your understanding. If you're expecting to pick a specific variety the weekend you're coming, PLEASE CALL toward the end of the week to verify if it's available. 29 Old Myers Corners Road, Wappingers Falls, NY 12590. Phone: 845 297 3002. Alternate Phone: 845 298 8613. Fax: 845 298 8613. Email: applepicking@optonline.net. Open: Every day 9 am to 6 pm. Directions: Route 84 Exit 13, North on route 9 for 5 miles, Right on county road 93, 2.5 miles on right. 29 Old Myers Corners Road. Click here for a map and directions. Apple Picking starts September 3. Payment: Cash, Visa/MasterCard, Discover, AmEx. Delicious Apple pies, Apple Cider Donuts, Fresh Baked Goods , and our own Apple Cider. Secor Strawberries - Pumpkin patch, hayrides, Pumpkins & Seasonal Vegetables. 63 Robinson Lane, Wappinger Falls, NY 12590. Phone: 845-452-6883. Email: upick@warwick.net. Upick or ready-picked. Hayrides in the Fall. Directions: On Robinson Lane off Noxon Road (county rt.21) or off Route 376, 2 miles on right. A visitor writes on October 18, 2010: "This is great place so far. I visited this year for Pumpkin picking. They had great pumpkin patch. Although field was full of weeds, pumpkins were every where. All sizes available. Very good parking and NO FEES to park and enter the farm. Good place for picking vegetables and pumpkins." 60 Wigsten Road, Pleasant Valley, NY 12569. Phone: (845) 235-7469. Email: wigstensfarm@aol.com. Directions: Click here for a map or directions. pick your own pumpkins starting September 30, from 10 AM till 6PM. Pumpkins of all sizes, gourds, cornstalks, and haybales plus seasonal produce. 191 White Schoolhouse Road, Rhinebeck, NY. Phone: 845-876-6760. Email: L4obo@frontiernet.net. Our pumpkins are available wholesale and pick your own. Pick your own starts the third week of September thru the end of October on the weekends only. Christmas Trees are choose and cut starting Thanksgiving weekend 11/24 through 12/17 or until we sell out. Our hours this year are: Saturday and Sunday 9:30 till dusk. 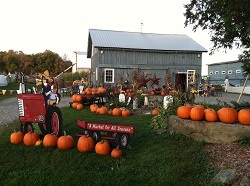 What you will see when you arrive is a 20 acre field filled with a variety of pumpkins ready for your family to wander. The fall colors on the ridge that boarders the field is usually spectacular. The pond will sometimes be full of wild ducks & geese. What you get on our farm is Nature in all its glory. Pumpkins of all shapes and sizes. We also have many specialty gourds ,Speckled Swan ,Bird House and others. So come and enjoy a family outing, bring the dog, pick some pumpkins,and soak up the scenery. Directions: TSP:take the Bulls Head Road exit Turn left.Continue on Bulls Head Road west for 5 miles.Turn right on White Schoolhouse Road & follow the signs. From Rhinebeck & Route 9:Travel east on Rt.308 for 3 miles turn right on White Schoolhouse Road & follow the signs. 10 Cochrane Road, Durham, NY 12422. Phone: (518) 239-6950. Email: CornMaze@Hull-o.com. Open: Seasonally, Labor Day - last weekend in October; from 11:00 am – 4:00 pm Weekends Only; plus Labor Day (Monday) & Columbus Day (Monday); Open Weekdays by appointment. Directions: Click Here for Directions. Find your way through the twists and turns of our 15 acre corn maze! We can be can be the perfect family vacation in the Catskills for you and your family. Hay Rides Will Have You Smiling from "Ear-To-Ear!" (included in Admission Price) Climb on board our hay ride for a fun trip to the corn maze! Home-Made Goodies; Take home some of these seasonal specialties: Indian corn, popcorn-on-the-ear, pickles, local honey & local syrup. Pumpkin Picking: We have quite a selection to choose from. 385 Route 17A (PO BOX 200), Bellvale, NY 10912. Phone: 845-988-5414. Fax: 845-987-7460. Email us at: amytim@warwick.net. Directions: Route 17A between Greenwood Lake and Warwick. Follow big orange pumpkin signs directly to patch. And for a map to our farm, click here. Crops are usually available in October. Open: Sat/Sunday 10-dusk October call before visiting Payment: Cash, Check. Every fall season children long for the days to pick pumpkins from a genuine pumpkin patch. Ours is open weekends in October. Take a free hayride to our five-acre pumpkin patch surrounded by corn fields and wildlife. 450 acre crop and livestock farm, roadside vegetable stand and Creamery featuring homemade ice cream, shakes, sundae's and more. Hoeffner Farms - pumpkins, Christmas trees. 405 Goodwill Road, Montgomery, NY, 12549. Phone: 845-457-3453. Open: May-Dec 25. Monday to Saturday, 9-6. Sun 9-4. Vegetable and bedding plants. Hanging baskets, seasonal fruits and vegetables. 420 Lower Road, Westtown, NY 10998. Phone: 845-544-5487. Email: lainwaymaze@gmail.com. Open: Fridays, Flashlight Nights, October and usually the first week in November, from 5pm to 8pm (last exit from corn maze 9pm); Saturdays and Sundays, September 18 through November 7, from 10am to 5pm (last exit from corn maze 6pm). Directions: From New York State Thruway I-84W; Head west on I-84 W; Take exit 3W for US-6 W/New York 17M W toward Middletown; Turn right at US-6 W/New York 17M W; Take the 1st left onto US-6 W (About 6 mins); Turn left at NY-284 S (About 8 mins); Turn left at County Road 1 (About 2 mins); Slight right at Grusz Road (About 2 mins); Turn right at Lower Road Destination will be on the left. Click here for a map and directions. Corn Maze and Pumpkin Patch is open on weekends, Saturdays and Sundays, from September 18 through November 7; Open Friday evenings for flashlight nights from October 1 through October 29. Payment: Cash, only. Fresh Apple Cider from local orchard. Local apples, spices, soup mixes, gourds and more. Route 207 & Lagrange Road, Campbell Hall, NY 10916. Phone: 845-742-8705. Email: summerset@frontiernet.net. Open: Weekends from 10am to 6pm, September 24 to October 31. Directions: Click here for a map and directions. We are certified organic for some crops. Payment: Cash, Visa/MasterCard, WIC Vouchers, SFMNP Vouchers. Click here for our Facebook page. A visitor writes on September 09, 2012: (positive) "I was hesitant after reading some negative reviews about Lawrence Farms Orchard (ed: on other websites) in Newburgh NY but I'm so glad we gave it a try anyway. The staff were friendly and helpful. The fruit and vegetables were plentiful and reasonably priced. The farm is beautiful. The children's village is really creative and the kids loved it. All around a great experience!" A visitor writes on July 01, 2010: (positive) "Just got back from a fantastic visit at Lawrence Farm Orchards and I can not say enough wonderful words about our trip. Called in the morning to confirm what was available for picking. The owner was very specific about crop availability (spinach, peas (all kinds) lettuce, zucchini, and limited raspberries and gooseberries. He apologized for not having more fruit available which was unnecessary as we completely understand crops vary from day to day. I must say that the one previous negative review of the farm was a concern, but we took the chance and made the 40 minute trip to the farm and boy are we glad we did. When we arrived at the farm, he took the time to point out all areas of the farm as well as location of the crops and to go over when new crops would be ready for pick your own. The vegetables were magnificent. I have never seen lettuce that big and healthy before. The zucchini were also quite large and the spinach was also A+. He even told us we were more the welcome to verify the raspberry bushes if interested. The prices were great. The farm is huge with a variety of animals to look at and feed including goats, swans, chickens, ducks, and horses (though you can only really feed the swans/ducks and goats. The farm also has a great old fashioned children's village with wooden houses and interior furniture. Our children 5, 3, and 2 did not want to leave. As well as a quaint farm stand with wonderful jellies, jams, and other homemade goods. They also have food including pizza, hot dogs, french fries, ice cream, cider doughnuts, etc. to snack. We left with enough peas, spinach, lettuce, and zucchini to last quite some time and were amazed how cheap it all was. 10 pounds of zucchini, 2 pounds of spinach, 1 pound of peas, and a head of lettuce - 22 dollars - how can you go wrong. They have an abundance of crops for pick your own (in late July/early august they often have 12 different fruits and vegetables to pick) and also give you the option of filling out postcards which they mail letting you know when peaches, apples, strawberries, and Christmas trees are ready for picking. We will most definitely be back to Lawrence farms and everyone is looking forward to it. I highly recommend this farm as it has quickly become a family favorite. I am surprised someone had such a bad experience with Lawrence Farms because they were so welcoming, helpful and genuine. If you have the opportunity to visit, especially with kids, this is one place not to miss." A visitor writes on May 24, 2010: (positive) "I have visited about four times a year for the last three years and been very happy. It is a wonderfully kid-friendly location with big open spaces, well-groomed picking areas, play area, farm animals, and a corn maze in summer. It is far enough away from the city that it doesn't turn into a complete zoo like Westchester farms. It is true that cheaper farms can be found for adults who are doing serious picking, but for a great day with the family (especially with young kids) this user-friendly farm is a fantastic option." Sunday 9am – 6pm; hayrides run continuously every Saturday, Sunday and Columbus day; from 10:30 to 5 pm and weekdays at 4:30 pm and 5 pm. Local produce, homemade fudge and baked goods, country crafts, flowers & gifts. 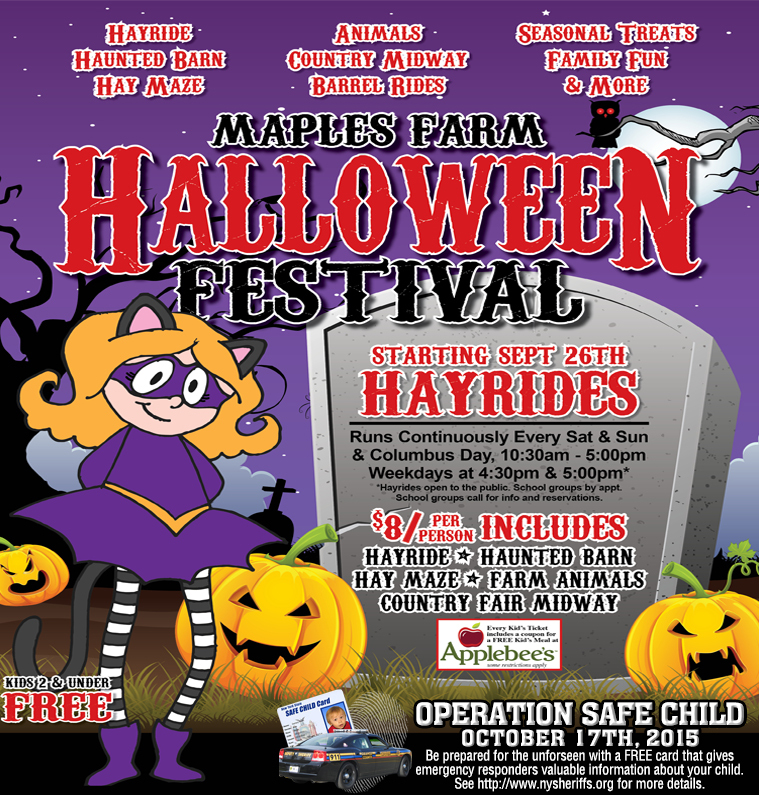 Pumpkin picking, hayrides, barnyard animals, hay maze and haunted barn in October. Cut Christmas trees, wreaths and poinsettias in December. Overlook Farm Market - Pick your own apples and pumpkins, hay maze. Route 9W, Newburgh, NY, 12550. Phone: 800-291-9137 or 845-562-5780. Fall harvest weekends feature hay maze and fishing at the pond. Picnics packed in your basket or ours. Petting zoo. 4 miles north of I-84. Open: March-Dec, 8-8. Closed Tues.
Route 6, Slate Hill, NY, 10973. Phone: 845-355-4493. Email: info@slatehillorchards.com. Open: UPDATE for 2018, Their website is gone; Does anyone have current information, are they still offering pick your own or are even open? If so, please write me, their last reported hours were Mon - Sun: 7:00 am - 6:00 pm. Directions: 6 miles west of Middletown. Quality fruits & vegetables, honey, maple syrup, preserves, apple cider, cheeses, fruit cake. Direct receivers of Florida and California citrus. Year-round. Fun For The Entire Family!... Hay Rides, Farm Tours, Food & Drinks, Tastings & Samplings, Hay Maze, Bounce House, Gourmet Fudge, Freshly Bakes Cider Donuts, Candy & Carmel Apples Made Fresh Daily, Fresh Cider, Nature Path & More..
327-329 Glenwood Road, Pine Island, NY 10969. Phone: 845-258-4574. Fax: 845-258-4595. Email: info@rogowskifarm.com. And for a map to our farm, click here. Crops are usually available in All year. Open: Seasonally - as of 12/4/07 to Monday to Thursday 9 to 6 Friday - Sunday 9 to 7 Call to confirm. Payment: Cash, Check, Visa/MasterCard, AmEx. 2 South Mountain Rd, Pomona, NY 10970. Phone: 845-354-0369. Email us at: concklins@aol.com. Directions: Family owned since 1712. Home of the famous Apple Cider Donuts. Farm store, fresh pressed cider. Our own & locally grown produce, on the premises bakery, pies, cookies & cakes from century old recipes. Gourmet & organic foods, cheeses, teas & coffees. Farmers markets in tri-state area. Mail Orders welcome. Fall events: Pick Your Own Apples & pumpkins, pumpkin patch, corn maze, haunted house, soft bounce, soft slide. School tours & birthday parties by appointment. Directions: From New York City: George Washington bridge to the palisades interstate parkway north, approximately 30 minutes to exit 12, turn left at stop sign turn right at lights (route 45 north) we are 1/2 a mile on the right. See the website for directions from other starting points. Click here for picking updates. And for a map to our farm, click here. Crops are usually available in September, October. Open: Farm Store open daily 8am to 6 pm Closed January and February Please call ahead or check our website for dates and events information Payment: Cash, Check, Visa/MasterCard, Discover, AmEx. Dr. Davies Farm - PYO apples, pumpkins. Routes 304, Congers, NY 10920. Phone: (914) 268-7020. Open: everyday 10 am to 4:30 pm. Directions: from New York City: Cross George Washington Bridge, take the Palisades Parkway and get off at Exit 5N (303 N) Stay on Route 303 for 10 miles & Merge with Route 9W and stay North. Turn left onto RT 304. Farm stand is one quarter mile on the left. Also a farm stand with a variety of fresh produce and a picnic area. 101 Ackertown Road, Chestnut Ridge, NY 10952. Phone: (845) 356-1988. Special area for children's birthday parties (which include pony rides - parties only). 2 South Mountain Road, Pomona, NY 10970. Phone: 845-354-0369. Email us at: concklins@aol.com. Directions: From New York city: George Washington bridge to the palisades interstate parkway north, approximately 30 minutes to exit 12, turn left at stop sign turn right at lights (route 45 north) we are 1/2 a mile on the right. See the website for directions from other areas! And for a map to our farm, click here. Crops are usually available in September, October. Open: Farm Store Daily, 8 am to 6 pm Pick Your Own September and October Saturday and Sundays only, 10am to 5pm Closed January and February Apples September through end of October Pumpkins second week in October thru end of October Payment: Cash, Check, Visa/MasterCard, Discover, AmEx. Family owned since 1712. Home of the famous Apple Cider Donuts. Farm Store, fresh pressed cider. Our own & locally grown produce, on the premises bakery, pies, cookies & cakes from century old recipes. Gourmet & organic foods, cheeses, teas & coffees. Fall events: Pick your own apples, school tours, birthday parties, corn maze. Farmers markets in tristate area. 233 Hurd Parks Road, Swan Lake, Bethel, NY 12783. Phone: 845 583-4083. Open: September through November 2012, weekends from 11am to 5pm. Directions: See their website for directions. Payment: Cash, Debit cards, Visa/MasterCard . We also have indian corn, acorn squash, gourds, and cornstalks available. Everything you need for fall decorating right here on the farm. 209 Perkinsville Road, Highland, NY 12528. Phone: (845) 795-4037. Email: upick@duboisfarms.com. Open: August 17th-November 3rd, daily, 10am-5pm. Groups by appointment: Monday-Friday. October: 7 days/week: 9:00 am to 5:00pm. Groups by appointment. Directions: From New York City: Take NYS Thruway (I-87) Exit 18. Exit east onto Route 299 for 5.5 miles. Turn right onto US-9W for 4.6 miles. Turn right onto Perkinsville Road- go 0.8 mile; or take Taconic State Parkway to exit NY55W toward Poughkeepsie for 8 miles. Cross Mid-Hudson Bridge. Exit from Mid-Hudson Bridge (US44-NY55) south to US-9WS for 2.2 miles. Turn right onto Perkinsville Road- go 0.8 mile. Click here for a map and directions. Farm Market and Café. Weekend Barbeques. Pick Your Own Nectarines, Plums, Apples, Pears, Peaches, Grapes, Tomatoes, Eggplant, and Pumpkins. Farm Market and Café, Bakery. Delicious desserts, including homemade apple cider donuts, served warm; cotton candy; snow cones; etc. Weekend Barbeques. Expanded 2-acre corn maze, tractor-pulled wagon rides, contests with prizes, visits with farm animals, and much more. "Tiny Town"- a child-sized, colorful, and fun village in a park-like shaded area. Pony Rides. Payment: Cash, Major Credit Cards Accepted. A visitor writes on September 05, 2011: "There is a festival every weekend. The calendar of events is on the website. They make fresh apple cider donuts which are awesome!! The bakery is great! And they have Tiny Town, a child sized village. My family had so much fun!!!" 2187 Route 32, Modena, NY 12548. Phone: (845)883-7825. Email: susan@hurdsfamilyfarm.com. Open: Fall Hours are Saturday & Sunday, August 18th & 19th, Saturday & Sunday, August 25th & 26th, September 1st through November 4th​ for Apple Picking & Barn Market 9AM-5PM, Activities 10AM to 4PM, Cafe Weekends & Holidays 11AM to 4PM; 2018 Winter Hours are November 23rd through December 16th, Black Friday & Weekends ​9AM-5PM. Directions: Click here for a map and directions. Payment: Cash, Check, Debit cards, Visa/MasterCard, Discover, AmEx. More information: Corn Maze, School Tours, Events, Apple Picking, Recipes, Healthy Apple Twists, Photo Gallery, and a Map. Click here for their coupons! A real Fall Harvest experience ... and folks come back to the farm's Tree Plantation to harvest their own fresh Christmas trees! In the Fall ... For the young and young-at-heart, enjoy apple and pumpkin picking, hayrides, bonfires, and a cornfield maze. Feed farm pets at the Critter Corner and play at the Kid's Corral. Visit an 18th Century Dutch Threshing Barn for country gifts and refreshments. Children love our barn side pick your own salad garden. Moms tell us that kids who do not usually eat peppers zucchini or cucumbers will enjoy the fresh vegetables when they harvest them themselves. Our corn maze does not have corn you can eat, but we do have a corn field filled with sweet corn that adds to our summer pick your own experience. Raspberries on the farm ripen late summer and are abundant in the early fall until our first hard frost. In the Fall ... For the young and young-at-heart, enjoy apple and pumpkin picking, hayrides, bonfires, and a cornfield maze. Feed farm pets at the Critter Corner and play at the Kid's Corral. Visit an 18th Century Dutch Threshing Barn for country gifts and refreshments. Remember to come back in December to harvest your own fresh and fragrant Christmas tree. Our Apple Variety Information: Please note, these are just general guidelines. The weather determines when the apples are ready each year. Please sign up for our emails or call to see which varieties are ready each week. Early Season Apples: August – Early September: Gala, Ginger Gold, Honeycrisp, Jonamac, McIntosh. Mid-Season Apples: Late September – Early October: Cortland, Crispin(Mutsu), Empire, Early Fuji, Golden Delicious, Jonagold, Macoun, Red Delicious, SnapDragon. 69 Yankee Folley road, New Paltz, NY 12561. Phone: 845-255-0999. Email: adapc@bestweb.net. Open: 9AM to 6PM - Monday-Friday; 9AM to 7PM Saturday and Sunday; Closed Wednesdays from January 1 - May 1. Call ahead during summer months for produce availability. Payment: Cash, Check. Directions: And for a map to our farm, Click here. Our bakery is open producing fresh baked pies, brownies, and other tasty treats! Call or visit to pre-order your baked goods. Christmas tree varieties: PreCut varieties: Balsam Fir, Douglas Fir, Fraser Fir. 5755 Route 209 , Kerhonkson, NY 12404. Phone: 845-626-7137. Fax: 845-626-7137. Email us at: info@kelderfarm.com. And for a map to our farm, Click here. Open: every day 10am-6pm. Payment: Cash, Check, Visa/MasterCard. Educational tours are offered April-October. Our tours are for all ages and curriculums! Give our knowledgeable and friendly staff a call. Fall Harvest Weekends every weekend until the end of October. Hayrides to the pumpkin patch and a variety of pick your own apples, concord grapes, sweet corn, red raspberries, tomatoes, cherry tomatoes, beans, peppers, onions, eggplant, squash, and u-cut flowers! Jumping pillow is up, up, up and the animals are here for you to visit! A visitor writes on October 11, 2008: "We love this farm and we've been there many times. Now they're advertising: Strawberries, Blueberries, Blackberries, Raspberries, Pumpkins When we went last summer we picked blueberries, corn and potatoes. We also bought some loose flowers. " 326 River Road, Ulster Park, NY 12487. Phone: 845-331-6908. Email: Maynardorchards@aol.com. Directions: Half way between Poughkeepsie and Kingston off of Rt. 9w on to River Rd. And for a map to our farm, Click here. Crops are usually available in August, September, October. Open: Saturday and Sunday 10am to 5pm also Columbus Day Payment: Cash, only. Hurds Rd, Clintondale, NY 12515. Phone: 845-883-7102. Email us at: minardfarms@msn.com. Directions: NYS Thruway (I87) exit 18, turn right onto Rt 299. Right at 1st traffic light onto South Ohioville Rd to stop sign. Turn left onto Hurds Rd - we are .25 miles on left. And for a map to our farm, Click here. Click here for picking updates. Open: 10:00 am to 5:00 pm, August 28-November 1. Payment: Cash, only. We have over 100 acres of orchard full of easy-to-reach, beautiful ripe apples. We also grow peaches, nectarines, asian pears, raspberries & strawberries (for making jams & jellies), pumpkins, gourds and various vegetables. At our farm market you will find apple cider donuts (we dare you to eat just one! ), our own fresh pressed apple cider and pear cider, homemade pies, homemade jam, jellies & fruit butters, local honey, NY cheeses, NY maple syrup, homemade soap and much more. Oh – don't forget the roasted corn on the cob and hay wagon rides through the orchard. Bring a picnic lunch or visit our snack bar. Picnic tables are available at the farm market and in the orchard. We also have clean, modern restrooms at the farm market for your convenience. Look for our apple in the sky. 75 miles from NYC. 40 Clark's Lane, Milton, NY 12547. Phone: 845-795-2383. Fax: 845-795-5345. Email: info@prospecthillorchards.com. Directions: Route 87 North to Exit 17 in Newburgh Route 84 East to Exit 10 Route 9W North, 10 miles north of Newburgh, to village of Milton. Follow the bright yellow "Prospect Hill Orchards" signs Go here for directions to our farm. Open: Weekends Only 9 a.m. to 4 p.m. Cherries available after June 20th each year, Friday, Saturday and Sunday Peaches, Nectarines available 2nd, 3rd, 4th weekends in August Apples, pears, pumpkins available mid-Sept- mid to October. Events Calendar: Kid's Days-last weekend in September Johnny Appleseed Cider Festival-Columbus Weekend Payment: Cash, only. Route 209, Accord, NY 12484. Phone: 845-626-1532. Email: info@rondoutvalleygrowers.org. Open: May through November. Directions: Click here for a map and directions. Payment: Cash, Check, Debit cards. Click here for our Facebook page. We refer you to the wide variety of PYO farms in the Rondout Valley region. Our growers use minimal chemical inputs, and produce apples, raspberries, strawberries, blackberries, blueberries, corn (sweet), vegetables, flowers, grapes, and pumpkins. 3012 Rt 213 POB 867, Stone Ridge, NY 12484. Phone: 845/687-2587. Fax: 845/687-4379. Email us at: info@stoneridgeorchard.com. Directions: From I-87 (NYS Thruway) take Exit 19 to rt 209 south. Go 10.5 miles through the town of Stone Ridge. At the 2nd light turn left, go 2/10th of a mile to our farm stand (on the left hand side of the road. Come on in! Click here for a map to our farm. Crops are usually available in June, July, August, September, October. Open: September through October, 9-6, 7 days a week. Nestled in the Shawangunk mountains near the Catskills, Stone Ridge Orchard provides 115 acres of apples, raspberries, pumpkins, cider and other great farm products to pick or choose from in our farm stand. We're located in Stone Ridge, NY, between the hamlets of Stone Ridge and High Falls. Our farm stand is open 7 days a week from September through October for apple picking. Please call for u-pick hours of other crops and events during the year. Payment: Cash, Check, Visa/MasterCard, Discover, AmEx. 730 State Route 208, Gardiner, NY 12525. Phone: (845) 256-9109. Email: twolenbev@juno.com. Open: Click here for current open hours, days and dates. Directions: Click here for a map and directions. Apples: Mid September through October Cherries: June through Early July Tomatoes: August through September Pumpkins: September through October. Payment: Cash, Check, Debit cards, Visa/MasterCard, Discover. Click here for our Facebook page. In addition to the freshly picked fruits and produce available in bin quantities at the market, the farm offers wagon rides for "pick your own" crops. Nestled in a picturesque valley just below the Shawangunk Mountains, just 1.5 hours from New York City, Tantillo's offers an ideal, fun, and educational day trip for families, friends, and people of all ages! We welcome scheduled school and group outings; Contact us for pricing and availability. Feel free to bring along your leashed pets and picnic supplies! Enjoy our covered patio area while children play on our playground. We also have outdoor seating and relaxing, comfortable Adirondack chairs. We are a fourth generation family-owned fruit and vegetable farm in the scenic Hudson Valley. 15 Route 299 West, New Paltz, NY 12561. Phone: 845-255-8050. Email us at: info@WallkillView.com. A visitor writes on October 17, 2008: "it was the nicest farm in the area. the quality of all the vegetables, flowers, baked goods, etc. was great. they do a cool maze with corn and sunflowers lining the road side; they also have hayrides and hidden places in the corn mazes with picnic tables. i don't remember any animals, most of the information can be found on the website". 43 Mt Zion Rd, Marlboro, NY 12542. Phone: 845-236-2684. Email: weedfarms@msn.com. And for a map to our farm, Click here. Open: August 15th - August 31st open only on weekends from 10-5. August 31st - last weekend in October open every day from 10-5. Peaches and Tomatoes from start approx. August 15th. August 31st until late October is when the rest of our fruit is available. Bakery, hay rides, entertainment, is only avialable on weekends.Click here for picking updates. Payment: Cash, Check, Visa/MasterCard. 341 Pancake Hollow Rd, Highland, NY 12528. Phone: (845) 691 2339. Fax: (845) 691 8325. Open: seven days a week from 9am to 6 pm; Labor day through Halloween. Click here for current open hours, days and dates. Directions: Click here for a map and directions. Payment: Cash, Check, Debit cards, Visa/MasterCard, Discover. 699 State Route 208, Gardiner , NY 12525. Phone: 845-255-5300. Fax: 845-255-5301. Email us at: mbtbcbsbmb@aol.com. And for a map to our farm, Click here. Click here for picking updates. Crops are usually available in June, September, October. Open: Our farm market is open 7 days a week 8:00 to 6:00 year round. Pick your own is open 8:00 to 4:30 7 days a week Call or check website for exact dates for pick your own. Cherry picking late June to begin of July. Apple picking Mid September to end of October. Pumpkin picking last weekend in September to last day in October Payment: Cash, Check, Visa/MasterCard. We have a fabulous farm market too. Spring and Summer we have beautiful bedding plants and hanging basket of sale. Fall we have hundreds of mums and fresh picked fruits and veggies. Winter we have apple wood for sale to keep you warm and cozy all winter long. 42 Wood Street, Katonah, NY 10536. Phone: 914-245-2319. Email: info@amawalkfarm.org. Open: Saturdays 10 am to 5pm Sundays 2 pm to 5 pm. Directions: 3.5 miles west of I-684 on NY Rte 35, turn L onto Wood St Go about 1m, turn left at U-Pik Raspberry sign onto Saward Lane Go about 3/8 m on gravel road to parking signs. Pumpkins from early September through mid-October Raspberries August through mid-October Cured hard-neck garlic available now through October Eggplant, squash, melons available now. We are certified organic for all crops! Payment: Cash, Check. NOFA Certified Organic Farm Raspberries, garlic, heirloom tomatoes, eggplant, scapes, pumpkins Occasional fresh farm eggs Occasional jam and pies. 62 Granite Springs Rd, Granite Springs, NY 10527. Phone: 914-245-2784 . Email: shawnpelkey@yahoo.com. Open: Monday - Sunday 9 am to 6 pm. Directions: Click here for a map and directions. apple picking End of August - Halloween pumpkin picking September - October Christmas trees day after thanksgiving- Christmas eve. Payment: Cash, Check.